Modern and feminine fashion design (think Kate Spade) inspires a glamorous, city-chic wedding with plenty of pops of pinks, bold stripes and shimmery gold. 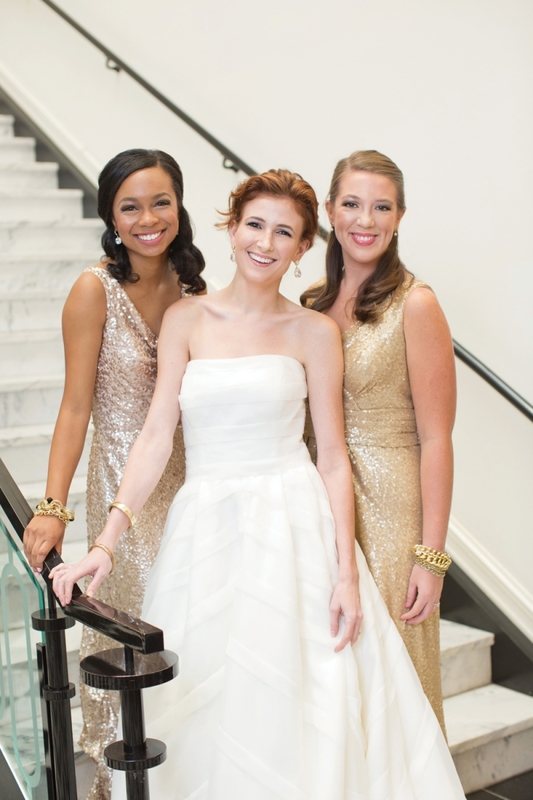 ABOVE LEFT TO RIGHT Kaschia dons a champagne sequined cowl neck gown (Dessy) from Bliss Bridal. Black stones and gold chainlink bangles and cushion-cut rhinestone earrings add panache (Private Gallery). Bride Heather is chic and modern in an organza striped A-line gown (Justin Alexander) with glitzy drop earrings from Bliss Bridal. Gold bangles are simple and sophisticated (Private Gallery). Olivia is glowing in an antique gold sequined V-neck gown (Bill Levkoff) from Bliss Bridal. Stacks of gold chain bracelets make a statement (Private Gallery). 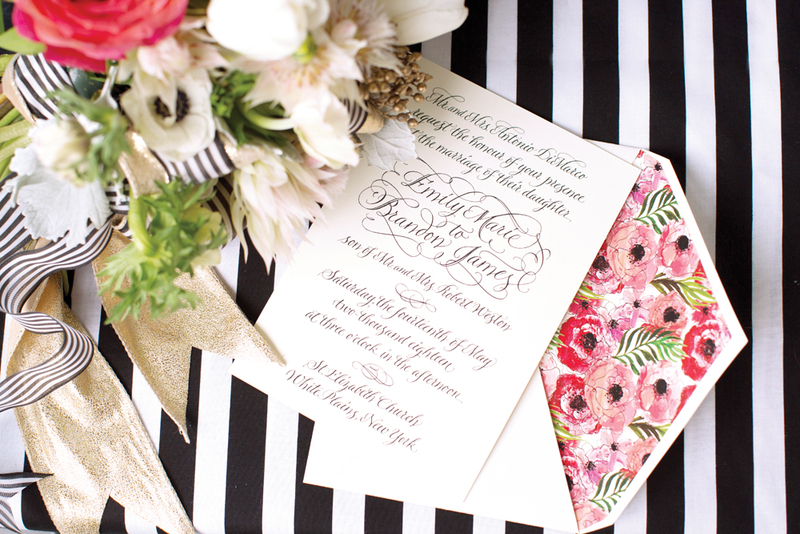 ABOVE Classic black calligraphy on a crisp white linen paper invitation gets updated with a surprising watercolor poppy envelope liner (Soiree Signature). ABOVE This over-the-top bridal bouquet evokes high-fashion glamour and femininity. Pink and white tulips mingle with crisp ivory anemone, dusty miller, scabiosa pods, viburnum berries and quintessential roses. 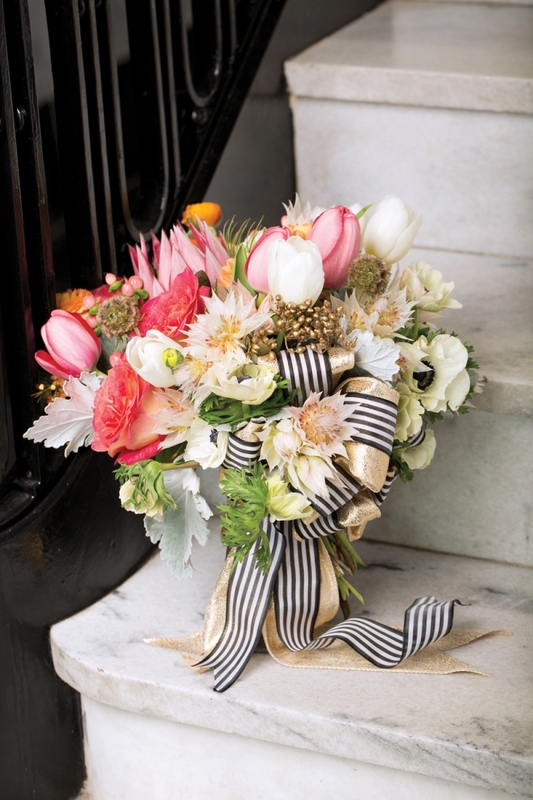 Thick, textural gold and preppy black-and-white stripe ribbons make a bold and beautiful bow. 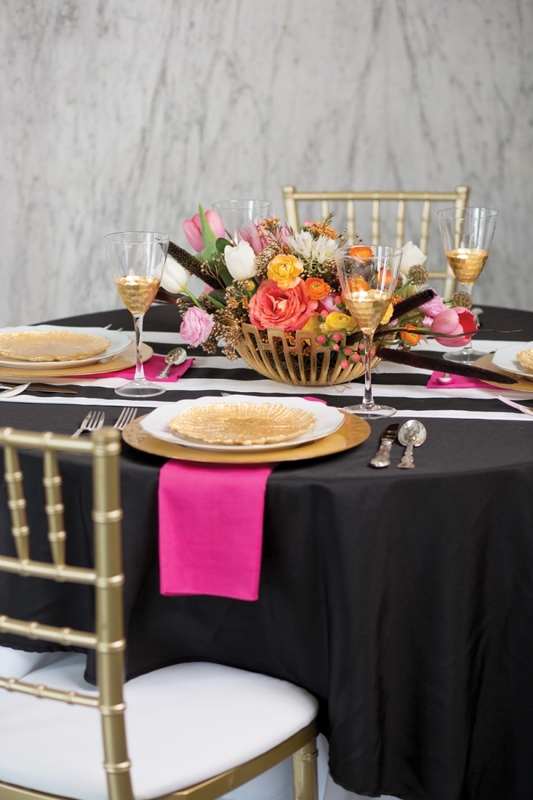 ABOVE For a sit-down dinner, dress a chic table with black and white linens and gold chiavari chairs (Port City Rentals). Breathtaking florals include pink and blushing bride protea, white anemone, pink and white tulips, coral roses and orange, pink and peach ranunculus (Julia Greer Fobes Fashion • Art • Flowers). The arrangement is tucked into a simple gold art-deco-style bowl, low enough for guests to see over it to have a conversation. 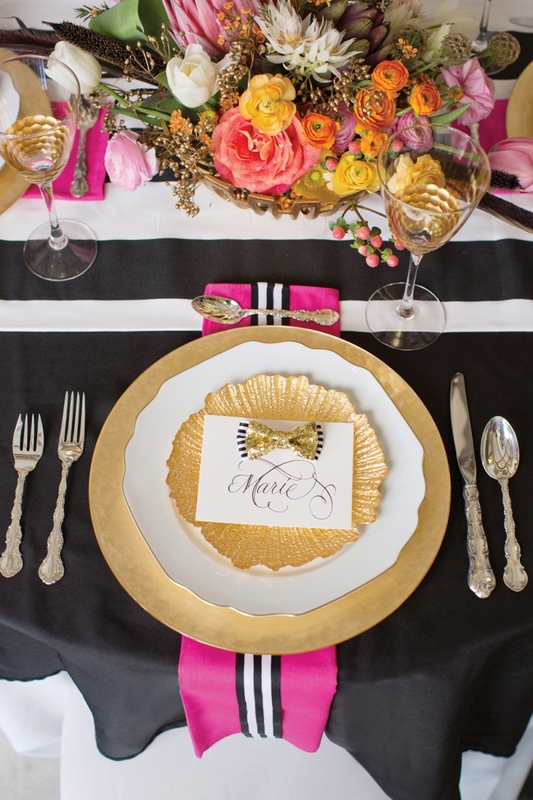 Elegant place settings polish off the look. Glass gold chargers are layered beneath scalloped gold-rimmed dinner plates and glass gold-leafed salad plates. Gold beveled wine glasses and sterling Strasbourg five-piece place setting are timeless touches (Claude Moore Jeweler). ABOVE Bride Heather is a vision in a simple silk ballgown (Moonlight) with an elegant low back and covered buttons down the train (Bliss Bridal). The History Museum of Mobile’s grand foyer staircase makes a monumental portrait location. ABOVE LEFT TO RIGHT Kaschia models a tea-length pink shift (Alfred Sung) from Bliss Bridal. 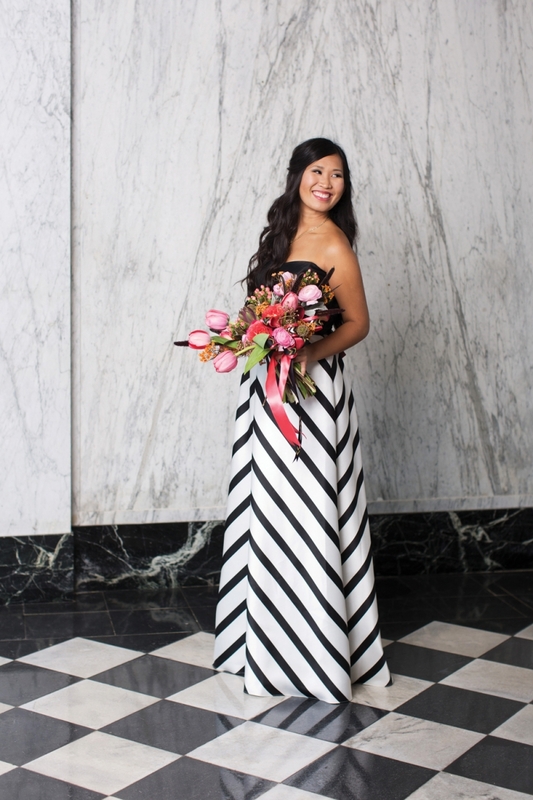 Olivia is uber chic in a black-and-white high-low number (Alfred Sung) from Bliss Bridal. Victoria looks party-ready in a strapless LBD (Alfred Sung). All jewelry from Private Gallery. 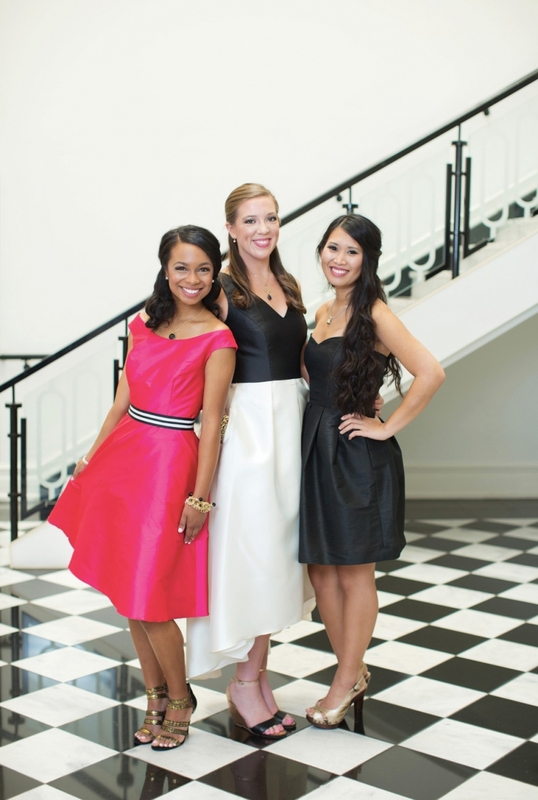 ABOVE RIGHT Victoria wears a showstopper long black-and-white strapless gown (Alfred Sung) from Bliss Bridal. The bold stripe pattern makes a statement and adds the illusion of height to shorter attendants. A simple black drop pendant necklace is a perfect bridesmaid gift idea (Private Gallery). 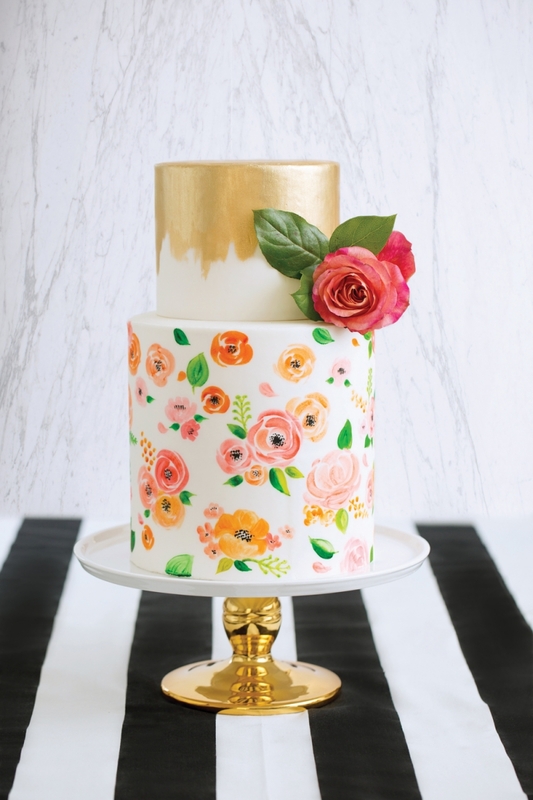 ABOVE A two-tiered, fondant-covered confection (EllenJay Stylish Events + Sweets) with a hand-painted floral print and gold brushstroke motif combines traditional shape with out-of-the-box decor. A single live rose blossom finishes off the look. 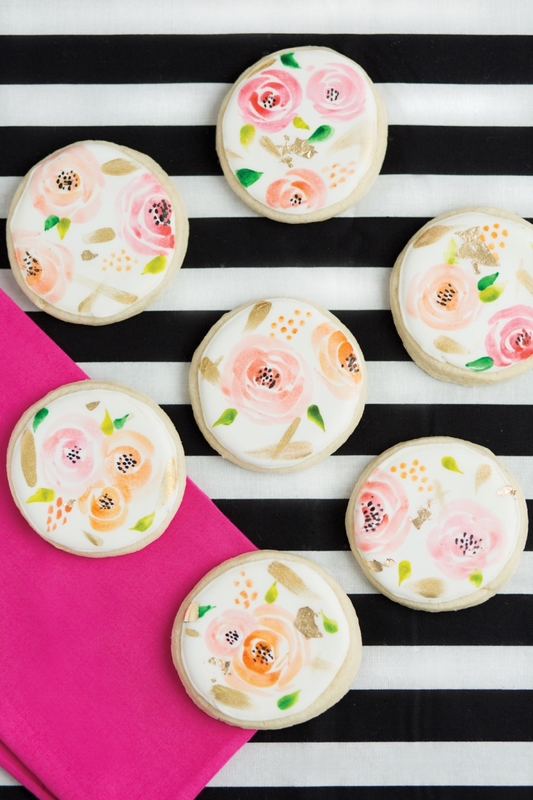 ABOVE LEFT Melt-in-your-mouth sugar cookies, hand-painted with edible watercolor flowers and gold leaf, make delicious and memorable favors for guests to take home (EllenJay Stylish Events + Sweets). 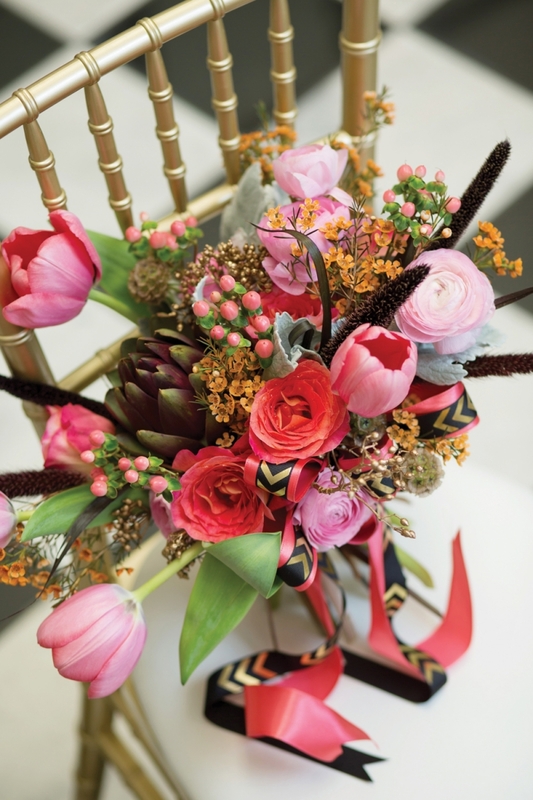 ABOVE RIGHT Variegated poppies, pink tulips, peach hypericum berries, orange wax flower, dusty miller, gold-leafed viburnum berries, scabiosa pods, artichokes and black millet are unexpected additions to a bridesmaid’s bouquet. Satin coral ribbon and black and gold grosgrain cinch the arrangement (Julia Greer Fobes Fashion • Art • Flowers). Claude Moore Jeweler • 3700 Dauphin St. 380-9400. Ellen Jay Stylish Events & Sweets • 2158 Airport Blvd. 219-7406. Julia Greer Fobes Fashion • Art • Flowers • 463-5691. History Museum of Mobile • 111 South Royal St. 208-7569. Port City Rentals • 3252 Old Shell Road. 471-5484. Soiree Signatures • 2158 Airport Blvd. 209-3265.